The WeatherTech Pet Ramp was designed for the comfort of our furry friends and their handlers. The portable Pet Ramp features a non-slip surface providing dogs, cats and pets of all sizes easy access to SUVs, minivans, trucks and hard to reach household spaces. Easily folds for storage and carrying. 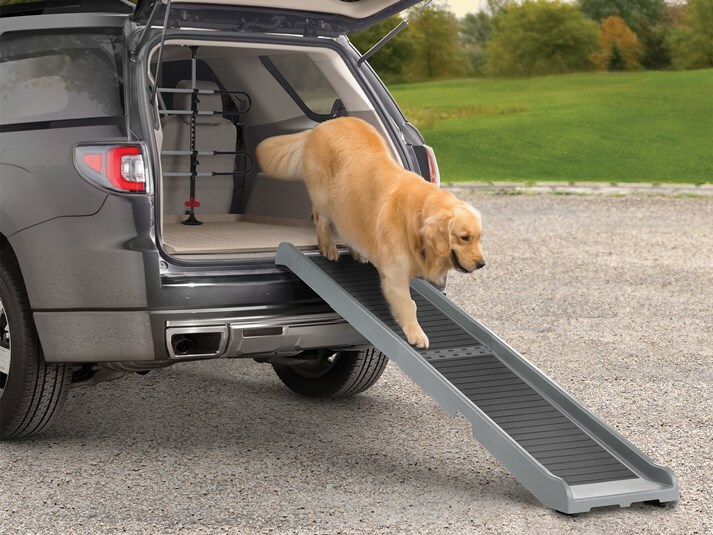 The WeatherTech Pet Ramp helps pets of all ages to access vehicles and various household areas. It also helps pet owners, who are unable to lift their larger pets without the risk of injuring themselves or their furry friends. Easy to use, the ramp simply unfolds into position, and the rubber feet at both ends help keep it from sliding out of place. It’s skid resistant surface includes specialized traction pads molded directly into the ramp help keep your pet safe and secure while going up or down. When not in use the pet ramp can fold down to an easy-to-carry and easy-to-store compact size, and with its lightweight construction and molded handles the Pet Ramp can go wherever needed. The only USA made Pet Ramp that we are aware of. Ultra-high, American-made quality...The WeatherTech way! Lightweight - only 7 kg. - and strong, designed to handle almost any domestic pet up to 136 kg in weight. Created from a leading edge USA made proprietary resin. Formulated for higher strength, durability and lighter weight. Designed with rubber feet on both ends, which were specially designed to help prevent the ramp from slipping/sliding on both the ground and your vehicle. The top of the ramp has a molded-in soft, textured rubber surface, to provide extra traction for your dog. The custom designed hinge provides strength, compact folding, and helps prevent hinge damage if accidentally dropped. By design the hinge end is flat when folded, allowing for easier storage. Integrated carrying handles on both sides of the Pet Ramp let you take it anywhere it’s needed. Easy to operate - simply unfold and place on vehicle/surface to be used. Durable and easy to clean - won’t rust or corrode. Helps prevent injury to dogs being lifted in and out of vehicles. Pet Ramp measures 170 cm long unfolded and 38 cm wide, and folds to a compact 85 cm long. Pet Ramp weighs only 7 kg and supports up to 136 kg. Is the PetRamp slick if it gets wet or if the dog’s paws are wet? No. the PetRamp is manufactured with a ribbed, non-slip surface making it easy for any pet to grip while entering or exiting the vehicle. Is the PetRamp foldable and easy to transport? The PetRamp features a lightweight design (7 kg) and can easily be folded and transported inside of any vehicle. The PetRamp measures 170 cm unfolded, 85 cm folded and 38 cm wide. Yes. The PetRamp can withstand a weight of up to 300 lbs at any given time.